Dr. Sedrak is an expert Dermatologic Surgeon. This encompasses treatment of Skin Cancer, Melanoma, Mohs Micrographic Surgery, Reconstruction after Skin Cancer Removals and more. 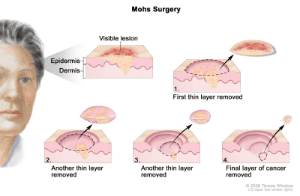 Mohs surgery, also referred to as Mohs micrographic surgery (MMS), is a procedure using both pathology and surgery to remove skin cancers in a physician’s office. Mohs is performed by cutting horizontal pieces of tissue from the bottom layer of the skin tumor. After the precise cut is made, the culture is immediately stained and examined under a microscope. Repeated saucer-shaped layers of tissue are removed and examined until no more skin cancer can be seen in the sample. If more cancer cells are seen under the microscope, tissue is removed at the site of involvement. Once the cancer has been fully removed, Dr. Sedrak will determine the type of repair for the best cosmetic result. Mohs micrographic surgery is an outpatient procedure done in a doctor's office under local anesthetic. On the day of your procedure, you should expect to be in the medical office for several hours. Depending on how large or difficult your skin cancer is, more time may be required for complete excision. It is not always possible to predict ahead of time how long the procedure will take. Your doctor will discuss this with you ahead of time. What Areas Are Treatable By Mohs? Depending on the specific patient and tumor type, Mohs surgery may treat any area of the body, but it's primarily used for the treatment of head and neck basal and squamous cell skin cancers. It is also very useful for skin cancers in difficult areas such as the nose, lips, and ears, where it is important to remove a minimal amount of uninvolved tissue. Hands and feet can benefit from MMS as well to minimize scarring. MMS is very effective for the treatment of tumors that were previously removed and have regrown at the same site. Dr. Joseph Sedrak is a fellowship-trained Mohs surgeon and Fellow of the American College of Mohs Surgery. The ACMS is the oldest professional organization of physicians who have attained extensive training and experience in Mohs Micrographic Surgery. Founded in 1967, one of the major goals of the ACMS is to ensure the highest quality of training in Mohs surgery, thereby ensuring the highest quality of care for patients undergoing this procedure. To be accepted as members of the ACMS, physicians must complete a three-year residency in dermatology, plus a one-year fellowship program approved by the ACMS that includes extensive training in Mohs surgery, pathology. and advanced reconstructive surgery. Dr. Sedrak underwent surgical training at UCLA and completed his dermatology residency and Mohs Fellowship at Loma Linda University Medical Center in California. Dr. Sedrak has performed many thousands of Mohs Surgeries with excellent outcomes in his career.